Orange and red is the color of the beak of a parrot. Little Wittians of Nursery of Witty International School, Udaipur were Introduced to orange color. They highlighted the importance of the day by coming dressed in orange colored clothes. 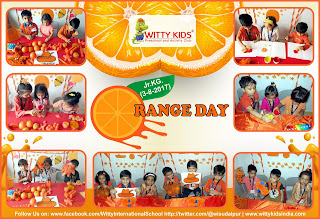 The class was beautifully decorated with orange color objects. Toddlers colored their worksheet with orange color .They observed the presence of orange color in their toys, worksheet ,crayons, balls, balloons and objects around them. Children were very excited when they mixed Red and Yellow color and then discovered orange color . Little Wittians enjoyed the day with great zeal.